Glanolmarch is mentioned in the will of Thomas Lewis of Llwyngrawys, Llangoedmor and Cardigan in November 1775, and he demised it to Zephaniah Davies, his nephew. Upon the decease of Zephaniah, Glanolmarch was to pass to his son, Thomas Davies. On 20th April 1789 Thomas David of Llanolmarch was a burgess of Cardigan. In 1883 a new house was begun here for John William Stephens, slate merchant. The architect was George Morgan of Carmarthen. It was completed and dated in 1885. In 1885-1910 John William Stephens and his family lived here. In 1885 J. W. Stephens of Glanolmarch was a Guardian of the Poor. In 1891 the following persons lived here: John W. Stephens, 62, retired merchant; Mary A. Stephens, 51, his wife; James Stephens, 27, their son, solicitor; Elizabeth Stephens, 25, daughter; Ellen Williams, 22, servant; Martha Lamb, 22, servant; and Anna M. Bishop, 20, servant. On 14th October 1896 Elizabeth “Lizzie” Stephens, only daughter of J. W. Stephens, married John Faulkes Jones of London. In 1897 John W. Stephens of Glanolmarch was a Rural District Councillor. In 1899 Alderman John William Stephens of Glanolmarch was President and Treasurer of the Llechryd Auxiliary Bible Society. Other occupants here included staff – Miss Sarah Elias and Miss Janet Mathias. In 1900 the occupiers were John William Stephens, Mrs. Mary A. Stephens and James Stephens, plus staff – Miss Sarah Elias and Miss Janet Mathias. The lodge was occupied by Thomas Daniel (gardener), Mrs. M. Daniel, Miss Mary A. Daniel and James Daniel. In 1901 the following persons lived here: John William Stephens, 72, retired slate merchant (b. Llechryd); Mary A. Stephens, 61, his wife (b. Caernarfon); James Stephens, 37, their son, solicitor (b. Caernarfon); Sarah Elias, 30, house maid (b. Penbryn); Janet Mathias, 31, cook (b. Pembrokeshire); and Benjamin D. Thomas, 70, visitor, minister of the Gospel (b. Woodstock, Pemmbrokeshire). The household was bilingual. In 1901-02 John William Stephens, Alderman, Guardian of the Poor, occupied Glanolmarch, as did Mrs. M Stephens, J. Stephens, James Stephens and William Stephens; staff – Miss Sarah Elias and Miss Jennet Mathias. A photograph from about this time shows Mrs. Stephens and her Sunday School class. On September 10th 1903 Miss Jennet Mathias of Glanolmarch married David Joseph Davies of Blaenffos. On 9th January 1910 John William Stephens of Glanolmarch died aged 82. On 20th December 1912 James Stephens of Glanolmarch married Elizabeth Williams of Anglesey. In August 1915 Mrs. J. W. Stephens presented Communion Cups to Llwynadda C. M. Chapel. In 1915-17 James Stephens lived here. According to another source, John William Stephens died in 1920 aged 92! On 8th October 1920 there was a clearance sale here for James Stephens, who was retiring from farming. In 1922 Mrs. Stephens lived here. By 27th July 1923 and in May 1924 Glanolmarch was advertised for sale with 8 bedrooms and 2 dressing rooms. The Stephens’ Cilgerran quarry finally closed in 1924. 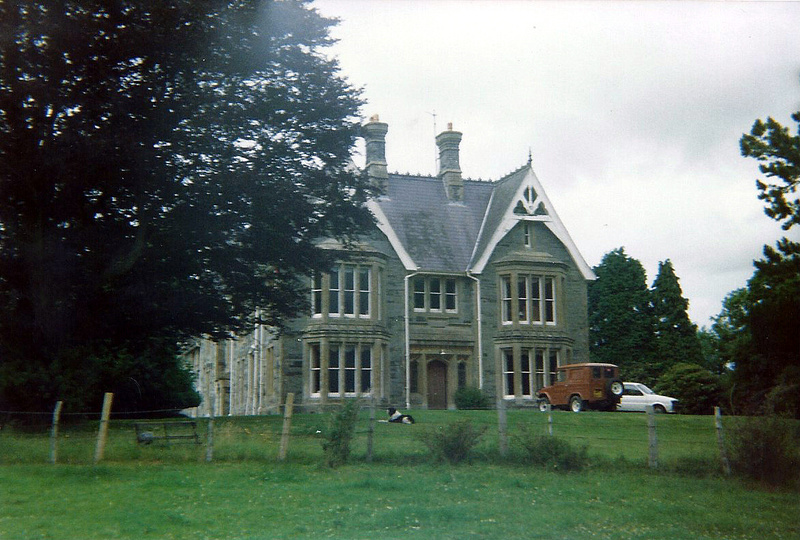 On 15th August 1924 David Charles Thomas of Stanley House, Cardigan, acquired Glanolmarch. On 24th September 1924 there was a clearance sale held here for Mrs. Stephens, who was leaving. On 17th January 1926 Mary Davies, widow of David Davies, Stanley House, died here at the home of her daughter and son-in-law – Mr. & Mrs. David Charles Thomas. In 1924-43 David C. Thomas lived here. In January 1928 Sarah James of the Lodge died aged 62. On 5th March 1937 many trees here blew down during a gale. In 1940 Nancy Jones of the Lodge died. In July 1941 Sgt. Pilot David Desmond Patrick Thomas, son of Mr. & Mrs. D. C. Thomas of Glanolmarch, was killed on active service at the age of 19. In May 1943 David Charles Thomas sold Glanolmarch to Mr. R. L. E Catcheside of Lancych. In 1945-50 Robert Lesle Egerton Catcheside and family lived here. On 18th October 1950 a clear-out sale was held here, Mr. & Mrs. Catcheside having sold the estate to Captain Garnons-Williams. In 1951-58 Captain G. A. Garnons-Williams, then retired, lived here. On 20th March 1958 Captain & Mrs. G. A. Garnons-Williams had a sale of stock and implements here. The house became a listed building in 1994. “…EXTERIOR – 1883-5 country house designed by George Morgan of Carmarthen for J W Stephens. Coursed Cilgerran stone with Bath stone dressings and steep slate roofs, crested ridges and corniced chamfered stone stacks. Two storeys and attic, L-plan, three-window front and long NW rear wing. Flush ashlar quoins, raised plinth. Front is framed by two steep gables with ornate timber bargeboards, collared with angle struts above and centre turned post. Two big ridge stacks. Attic narrow single light each side over big ashlar mullioned 1-3-1 light canted bays with cornices, brattished over ground floor and stone hipped roof. Centre has 3-light mullioned window over projected Gothic door and narrow sidelights, the sidelights ogee-headed, the door Tudor arched. Brattished cornice over and ashlar coping sloped back to moulded course stepped over blank rectangular plaque. W SIDE is plain running back to slightly projected gable with ornate bargeboards, and N end stack, then lower service range with eaves-breaking dormer to left and N end stack. Windows are long and mullioned to main part, 2, 1 and 2-light above, 2, 2 and two single lights below then door with shouldered head in projecting coped ashlar surround with gablet, and single stair light over. Gable has 2-light each floor and attic single light. Service range has 6-pane sashes, the side panes narrower, four above, two and one 3-pane below. E SIDE has Tudor-arched opening to ground floor, originally to conservatory, 2-light and single light above, then gable matching that on W except with ground floor 3-light ashlar bay. N return has side-wall stack, ground floor lean-tos and Gothic 3-light stair-light in angle to right. 6-pane sash each floor in E return. E front of service range has two 6-pane sashes above, two broad cambered arched openings below and window, door and window, the broad openings have Cilgerran stone voussoirs and have been subsequently glazed. A single storey range across N end of court has W end stack, door, broad carriage entry and door, all with Cilgerran stone voussoirs. Elizabeth Mary Foulkes-Jones (nee Stephens) died in childbirth 29th August 1897 at Glanolmarch. The son, born the same day, John Arthur Stephens Foulkes-Jones died, unmarried, 27 October 1944. Dear Glen, I am in the process of researching the family of John Foulkes Jones (1826-1880), a Calvinistic Methodist Minister from my home town of Machynlleth. I was fascinated to find the reference on your website to his son, John William Foulkes Jones (1867-1913), getting married to Elizabeth Mary Stephens on 14th October, 1896. However, I was a little surprised to note the contribution from Stephen Perkins suggesting that Elizabeth Mary Foulkes-Jones had died in childbirth in 1897. I can find no evidence of an Elizabeth of the right age dying in the district of Cardigan in that year. Indeed I have found both J W Foulkes Jones and his wife, Lizzie, alive and well and living at 7 Acacia Place, St Johns Wood in London in the 1901 Census. Their son, Arthur, is listed living with his grandmother, Margaret Foulkes Jones in Machynlleth. J W F Jones and Lizzie went on to have a further child, Margaret Mary Foulkes Jones, also born at Llechryd in 1902. In 1911, John Foulkes-Jones is listed staying at the Waterloo Hydro Hotel in Aberystwyth. At this time, Elizabeth Foulkes-Jones, now aged 44, is listed living at 20 Park Avenue, Willesden Green, London. In both 1911 Census entries, they are listed as having been married 14 years, with two children, both still alive. Their son, Arthur Foulkes-Jones, age 13, is at home with his mother. Their daughter, Margaret Mary Foulkes Jones, age 8, is living with her grandmother, Mary Foulkes Jones, in Machynlleth. J W F Jones died in Llandudno in 1913, but in the National Probate Calendar, his home is listed as 32 Dean Road, Cricklewood. Administration was granted to his widow, Lizzie Foulkes-Jones. It is not clear what happened to Lizzie in her later life, but she my have remarried a Herbert William Charles Cripps in 1953. I hope that you find this further information helpful. Incidentally, congratulations on producing a really excellent website. Regards, Rab Jones.